NORTHRIDGE, CA- James Quemata & Jose Uribe have had this goal in mind for years. 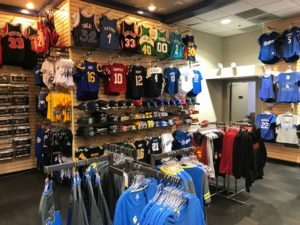 While working as colleagues in the sports fan industry, they used to discuss their dreams of partnering on their own stores. 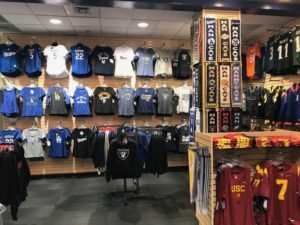 After opening their first store in Topenga almost two years ago, they recently opened a second location at the Northridge Fashion Center just in time for football season to kick off. 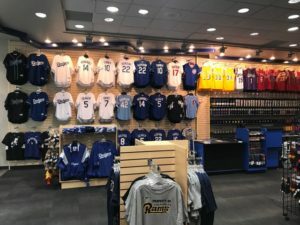 In addition to the new football season, the L.A. sports market has a lot of exciting things going on. From the Dodgers gearing up for another deep playoff run, to the Lakers signing of LeBron James, Los Angeles fans have no shortage of optimism. Uribe & Quemata have a deep roster of Dodger jerseys in a wide variety of players. That’s not even mentioning the two NFL franchises who are in their second seasons after relocating to L.A.; the Chargers and Rams. 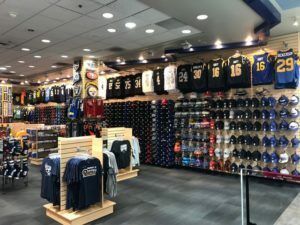 The new store in Northridge is loaded with jerseys, hats and apparel for both. If you’ve enjoyed the store in Topenga, make sure to visit Jose & James in Northridge as well. Congratulations to the two of them.